Fooding with Emily | Let the Noms be with you! Another sweet treat I pumped out over the holiday was a crap ton of marshmallows. 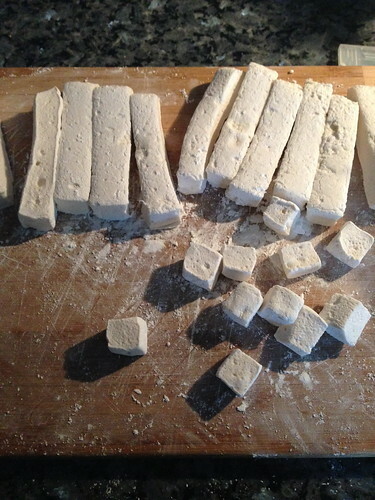 A friend of mine has made marshmallows before and I’ve always wanted to make them, I just never put the effort and time towards it. I finally mustard up the courage to make the marshmallows. I was armed with two recipes. They were both fairly similar, just two very minor differences. 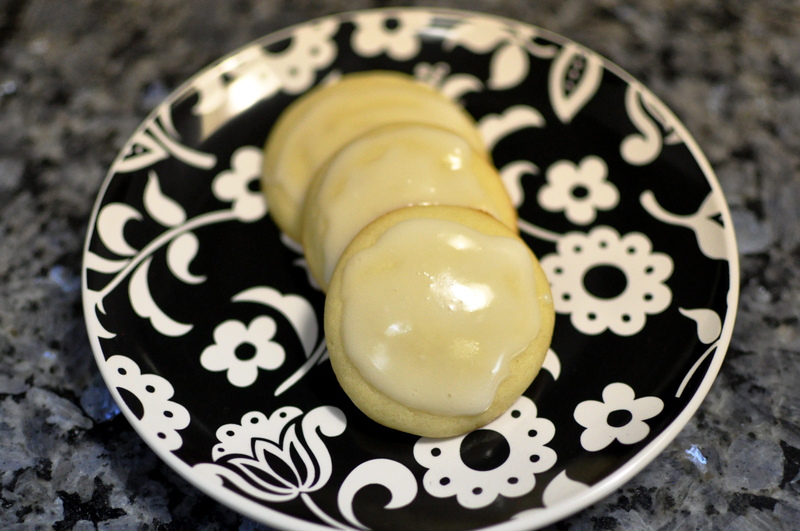 The first recipe I used was from How Sweet Eats. She made bourbon marshmallows a while back and of COURSE I had to get on that train. The second recipe was from Alton Brown. Traditional homemade marshmallows. Both required gelatin, white sugar, corn syrup, ice cold water, confectioners sugar and patience. How Sweet’s halved the water quantity, making it half water and half bourbon. She also used egg whites. The above picture was gelatin and melted sugars doing their thing. 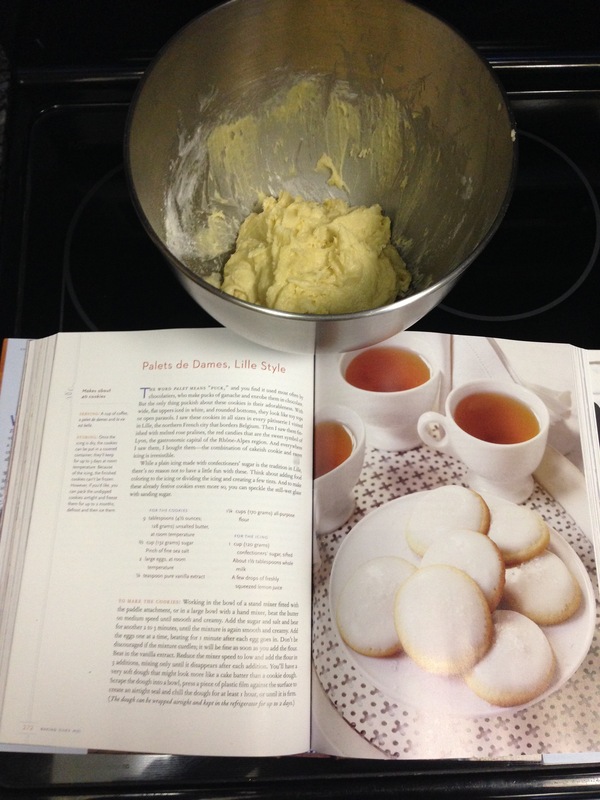 This is where the two recipes differ. How Sweets says to add whipped egg whites into this. This is also where I made a HUGE, MESSY MISTAKE. I didn’t read the recipe thoroughly. 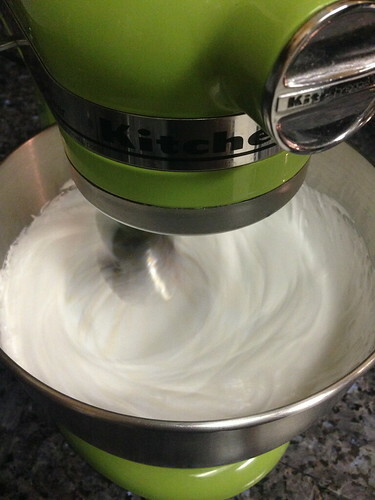 I had to remove the soft marshmallow blob from the mixing bowl and whisk, whip up my egg whites and combine everything. Don’t do this. Please. The mallow started to harden and it was a mess. I got it everywhere. It was a PITA to clean up surfaces I couldn’t soak in a sink full of hot water. 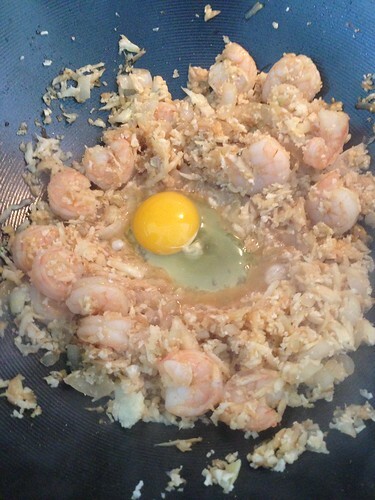 Also, whipping the egg whites back into this mess was also painful to watch. 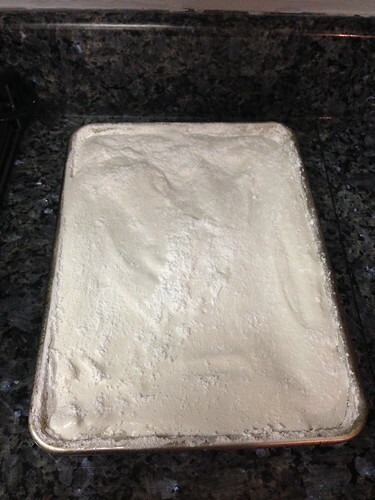 If you choose How Sweets recipe, arm yourself with a second mixing bowl or whip your whites before the mallow. Learn from my mistakes. Alton doesn’t use egg whites. Point for Alton, one bowl mess! He uses the same amount of ingredients as How Sweets, so you can easily sub in your bourbon. 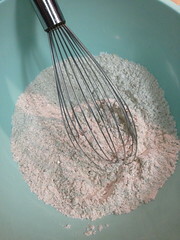 Once your mallow is whipped to perfection, dump it into a well greased and dusted pan to set for at least three hours. I let mine sit overnight. 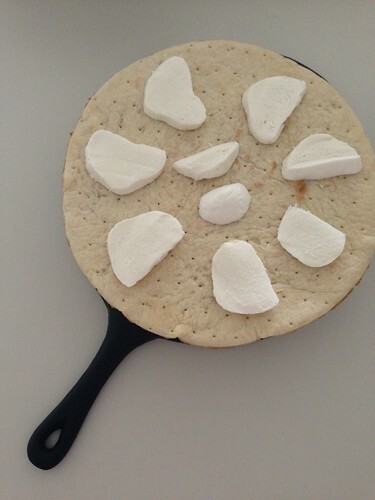 Once the pan of marshmallows has firmed up, transfer it to a cutting board and cut into whatever size marshmallows you desire. Dust all freshly cut sides of the marshmallows with confectioners sugar so they don’t stick to everything. Also dust your knife/kitchen shears to make it easy. I went with a smaller size to go along with a homemade hot chocolate mix. The egg whites in How Sweet’s recipe made the marshmallows lighter and airy, but it wasn’t a needed step. It caused more of a messy headache than anything. I wish I took a photo of the mess but I’m pretty sure I got marshmallow goo all over my phone and didn’t want to get more on it. They still tasted delish, but you can achieve a great marshmallow with Alton’s recipe. I’m giving Alton the win on this round. I got great reviews on the marshmallows. They didn’t melt too fast into coffee or hot chocolate, leaving you with a nice treat at the end of your drink. Yay! The holidays came and went. More like flew by! I made a MESS in the kitchen over the holidays. The best mess had to be gingerbread biscotti from Smitten Kitchen. The smell of baking biscotti swirling through the house made me smile. It smelled warm, inviting and freaking delicious. I’ve never made biscotti before. 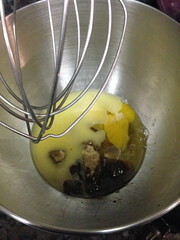 The thought of baking something twice made it seem hard and labor intensive. How wrong I was! The ingredient list was not a million miles long and was fairly reasonable. I had all of the spices in the pantry, and everything else was a staple. I’m serious. 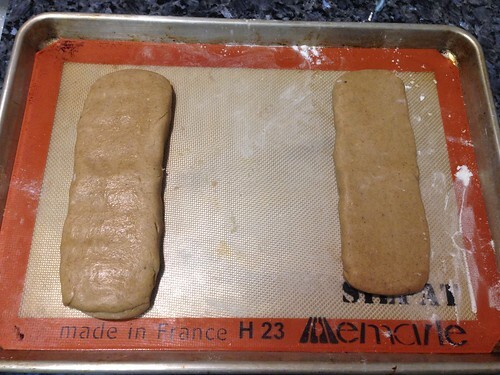 I bet $5 you can make biscotti now. It’s that simple! The “forming logs” part was a bit tricky for me, I admit. Only because I had no idea what I was doing. Also, I may have accidentally left out one cup of flour to the batter and had no idea how logs could be form with that mushy mess. Luckily, I realized my mistake and added the cup back in. Saved! Egg wash was next for the logs and into the oven they went for about 25 minutes. Let them cool on a wire rack for another 20-25 minutes and cut into slices on an angle. 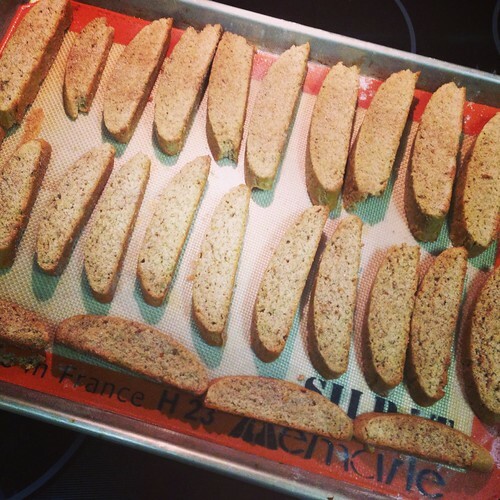 Dip the biscotti in a cinnamon/sugar mixture and back in the oven they go, about 12-14 minutes per side. I let my baking time go a little longer than SK’s. I might have crammed too many on my baking sheet, and also, no oven is the same. Adjust the second bake to your liking! Once the second bake is done, transfer to a wire rack and cool. I wish smell-o-vision was a thing. 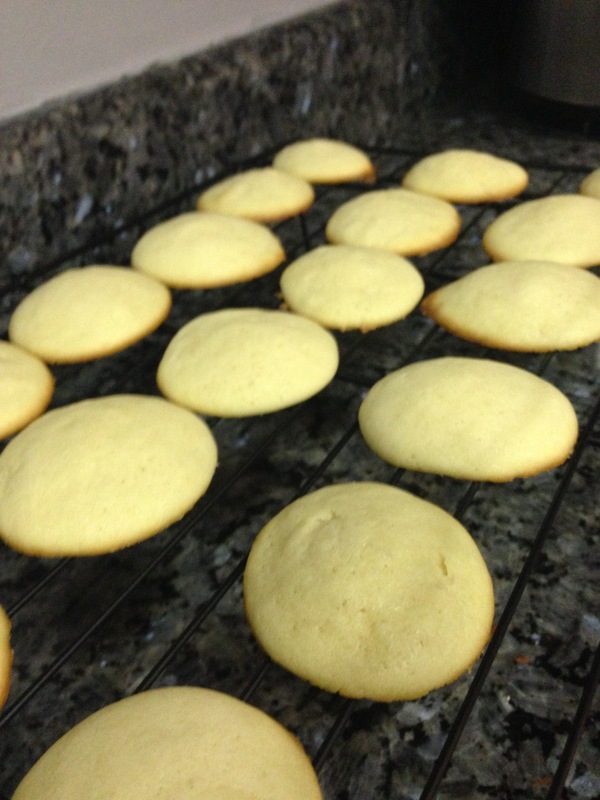 They smelled amazing and tasted great (or at least I thought they did!). Not too dry, but not soft. 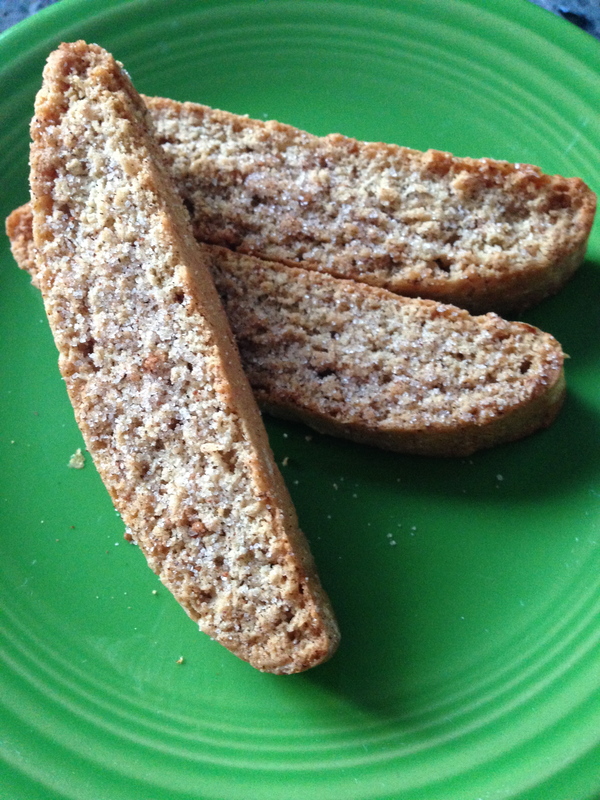 I am no longer afraid of biscotti and can’t WAIT to make more. 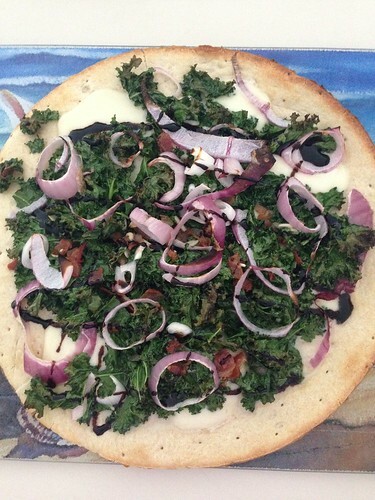 Kale + pizza = best thing ever. Kelly over at Just a Taste knows how to get my attention. She posted this recipe last month and I about jumped out of my seat when I saw it. I’ve been thinking about kale and how to use it other than just making chips. My first chip experience was a disaster and haven’t tried it since. But this? This I had to have. I like to use my cast iron pan for pizzas. Whether it’s a pre-made or homemade crust, using the cast iron pan is the way I roll. Slap some mozz on that crust. Cook up some bacon and reserve the fat. 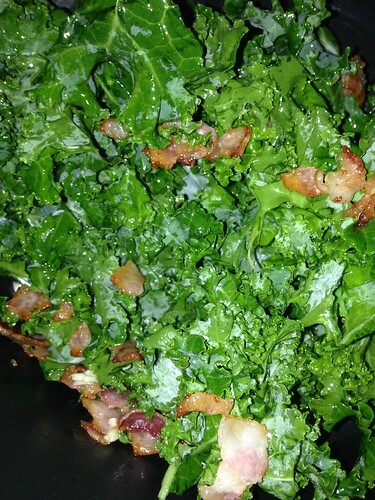 Toss in some chopped up kale with the bacon and it’s fat and coat it well. Dump that on top of the mozz, add some sliced red onion and anything else you fancy. Bake and enjoy. 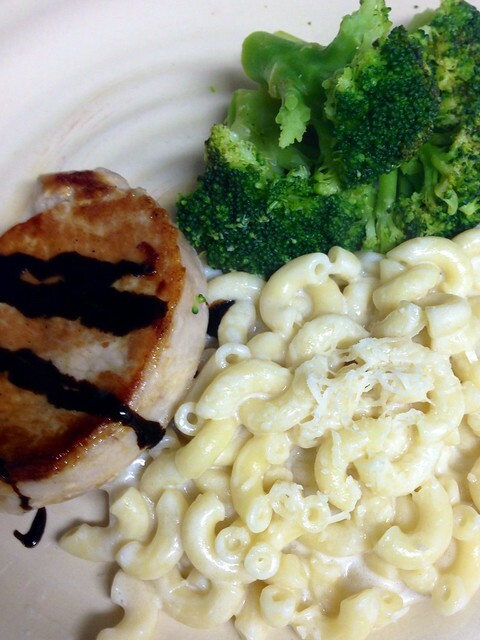 I drizzled some balsamic glaze on top as soon as I pulled this out of the oven. This might be one of the best ways to sneak kale into your food. Man was this AMAZING. If you’re not the kale type, I think spinach will sub well here. Go check out the full recipe over at Just a Taste. I’ve made a few things from Kelly’s blog and they’ve all turned out delicious. You can’t go wrong with her blog! 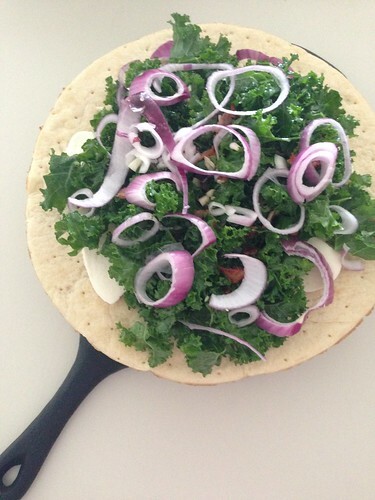 And make some kale pizza! AKA Fancy mac and cheese! I enjoy risotto and was slightly disappointed when I read through the recipe to find out it’s everything but. But man do I LOVE mac and cheese. Like LOVE. It is just the definition of comfort food. This fancier version might now be my go to for mac and cheese. 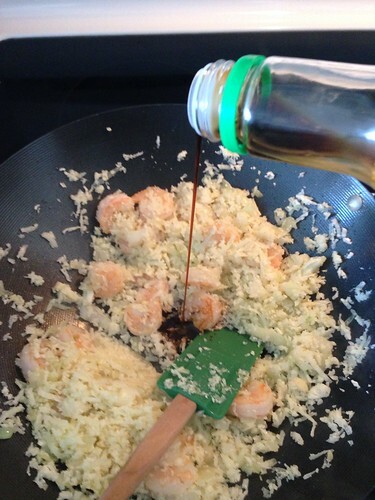 I normally make a roux, dump some cream in, melt the cheese and add the pasta. This was SO much easier. Dorie calls for chicken stock – lucky for me I made chicken stock earlier in the day. I had chicken parts in the freezer and was looking to free up some space. 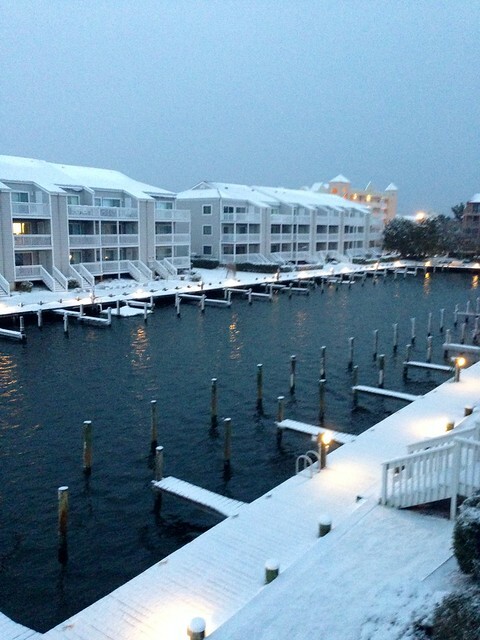 It’s getting colder here at the beach thanks to snow storm Hercules, so homemade soup will be happening later this week. The local fish market is having a HUGE sale on clams so I’m also thinking clam chowder is going to happen in the very near future. The perks of living at the beach! 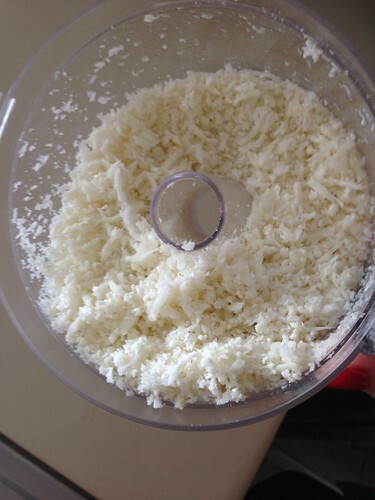 Back to that risotto … Onions, butter, chicken stock, pasta, cream, fresh grated parmesan and mascarpone. MMM. Dorie. It’s like you wrote this recipe just for me. Taking one of my favorite things to eat, making it fancy AND it’s a one pot wonder. Gah! I served mine up with some pork chops (thanks for the chops, Mom!) and greens. This was a hit all around. I will make this again that is for sure. 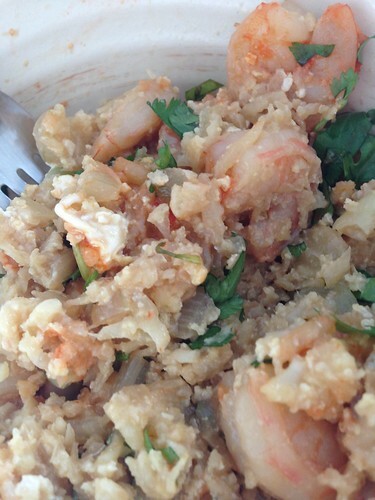 Check out what the other Doriesters are doing with their dressy pasta risotto here. Now I will stay indoors all day. It’s cold here! So over the weekend I made the compote de pommes as part of French Fridays with Dorie. 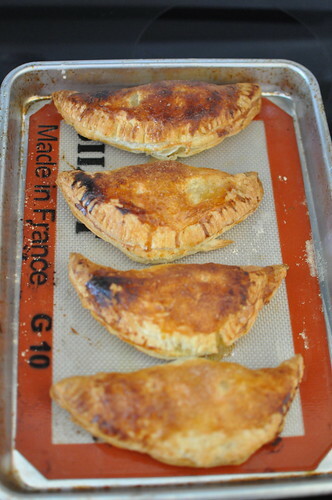 The bonne idee for the compote was to use it in some turnovers/hand pies. What a bonne idee it was. And so stinking EASY. The compote was super easy to begin with and why not make two things out of one recipe? Consider me sold. 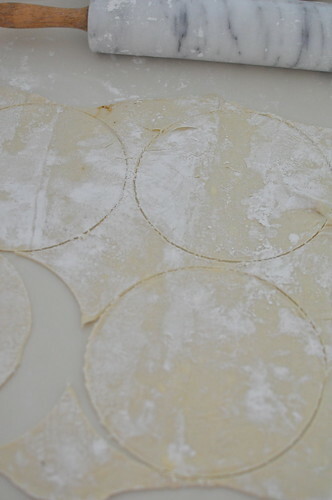 Thaw the puff pastry, roll it out and cut some circles. Stuff this with some compote, close it, crimp it and add a little egg wash for shine. Let it do it’s thing in the oven for 20-25 minutes and boom. 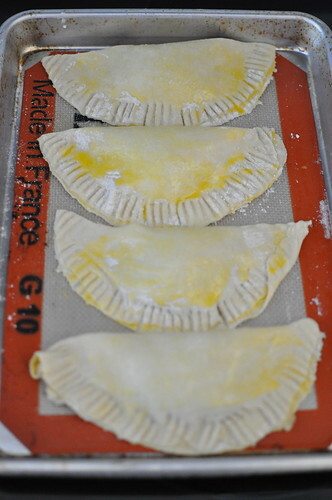 Turnovers/handpies. So simple! The puff pastry had a lightness to it but still buttery and delicious. The apple filling is simple and tasty. Personally, I enjoyed this turnover cold. There’s something about cold applesauce and that buttery crust that makes me happy. Now, what else can I stuff in these? !